Since 1959, DECO Boat Lifts has been a trusted manufacturer of boat hoist systems for waterfront properties in Cape Coral, Florida, and areas around the world. Our goal is to engineer boat lifts that not only provide year after year of reliable performance and protection for watercraft but also meet the unique needs of our customers. One of the ways we achieve this is by offering our boat hoist systems in a variety of configurations. 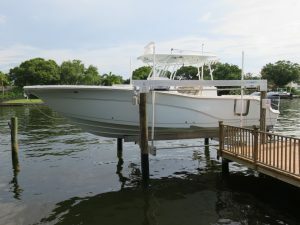 For example, boat owners who live in areas where pilings can’t be used can choose one of our boat elevators that can be mounted directly to the seawall. We also offer a Beamless Lift, which has no overhead beams and has four drive systems to deliver unrivaled lift power. Maxi Lift – A highly cost-effective boat hoist that features a heavy-duty aluminum flat plate drive to provide reliable performance for watercraft up to 16,000 lbs. DECO Lift – Our flagship boat lift has a superior box beam construction and our proprietary sealed gearbox design to deliver fast, quiet, and worry-free performance. Concept CRS Lift – A direct drive makes this boat lift incredibly powerful and low maintenance while our patented Cable Retention System (CRS) reduces wear to cables to effectively prevent overlapping and spooling. Contact DECO Boat Lifts today to learn more about how we’ll ensure you receive the perfect boat hoist for your property in Cape Coral, FL.